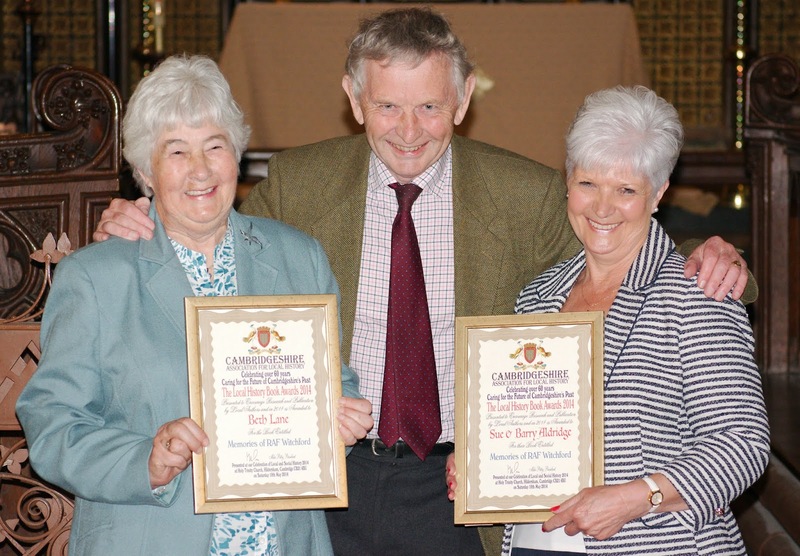 “Hildersham, where’s that?” Was my first thought when I heard that Sue Aldridge and her friend Beth Lane were to receive awards from the Cambridgeshire Association for Local History in the church there on Saturday, 10 May, 2014. It turned out to be a picturesque village, strung in a ribbon that straddled the river Granta. The interior of the Holy Trinity Church, where the event was taking place, was a Victorian gem of church painting. Prize winners Beth Lane and Sue Aldridge for work on "Memories of RAF Witchford"
“Memories of RAF Witchford” was the book that Jane and I had the privilege of publishing for Sue and Barry Aldridge. With Barry in a care home, it turned out to be a major project involving Sue, Beth Lane, Jane and myself. The collection of memorabilia at RAF Witchford formed a focal point for those who had served there and their families, looking for the personal link. The book provides a unique opportunity to take those memories back home. So far, Sue has managed to sell over 500 books. The awards ceremony by the Cambridgeshire Association for Local History was also a celebration of others interested in history, those who often toiled for years alone, pursuing a personal interest to keep alive the memory of local stories and places. The afternoon turned into a fascinating event. I learnt that the Cambridge and nursing homes were originally set up to cater for the poor students of Cambridge; that the Cambridge pumping station basement had to be illuminated by oil lamps in the days before even gas lighting was considered; the pubs of Histon and Impington have a long history going back into the 17th century; and that Cambridge has a rich rock musical heritage starting in the 60s that would otherwise have been lost! Full details of all the awards and prizes will be up shortly on the webpages of the Cambridgeshire Association for Local History at http://www.calh.org.uk/. The photos I took are available at https://picasaweb.google.com/107595387761034666575/CambridgeAssociationForLocalHistoryGroupsHR.